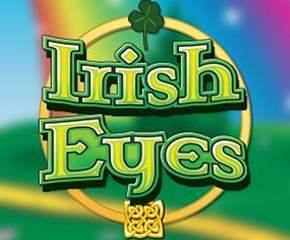 Coming from NextGen, the Irish Eyes slot game is a game that puts the myth of the luck of Irish to test. This slot game has everything you can possibly think about ireland from its greenlands to the beautiful eyes of the womenfolk there. The symbols in the game include an Irish lady, a leprechaun, pots of gold, rainbows and even the conventional deck of cards. The color theme from the rainbow has been used to design this slot game of which the yellow and green colors have been most widely used. Besides this the game has some really great feature which finally tend to prove that you really don’t need any extra irish help on luck to win big in this slot game. 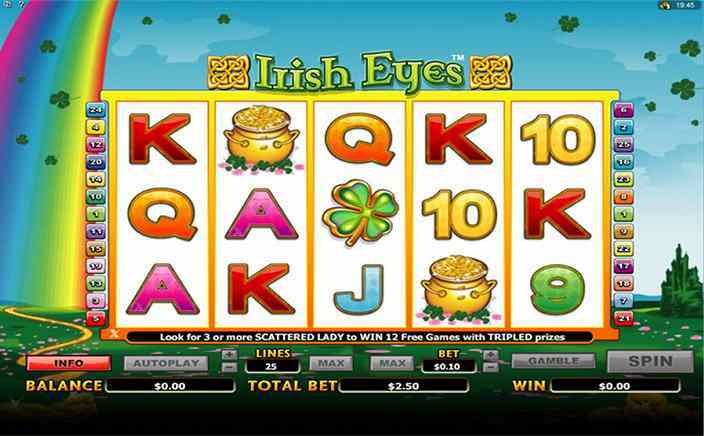 The Irish Eyes slot game is a 5 reel and 25 paylines slot game. Each line can be staked between 1p and £ 2. Though the paylines cannot be adjusted, these stake limits can and this makes the game playable between the limits of 25p per spin to £ 50 per spin. The game has some really great features and even houses a pick and win bonus game. This pulls the monotony out of video slot games and gives this game a charm of another level. The best way to make consistent wins out of Irish eyes is to keep getting matching symbols on your reels.But if this tends to be a bit too boring, then you can make use of the wilds and scatters in the game. The leprechaun is the wild symbol in the game and works to substitute for all the symbols in the game except the scatter symbol. But if the scatters do show in sufficient numbers, then you will hardly have a reason to feel disappointed about this minor setback. The Irish lady is the scatter symbol in the game. Getting three of these symbols triggers the free spins bonus game. In this bonus game you get 12 free spins and the best part is that all the returns you get out of this round are subject to a 3x multiplier. Getting the leprechaun on reels 1 and 5 triggers the pick and win bonus game in which you need to pick the right symbol to get a return of 100x your stake. However the grand jackpot in the game is worth 10,000 coins and this is more than enough to put your luck to test. Irish Eyes is a great game and has all the right factors in the right amount to make the game a hit. It also has a sequel which pertains to the fact that this game is pretty popular.